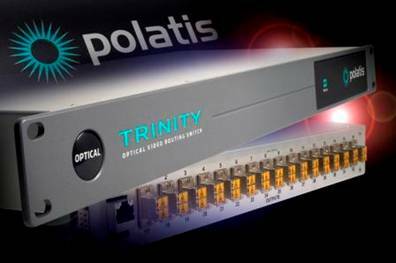 Cambridge, UK, and Boston, MA – August 7, 2008 – Polatis Inc., a supplier of high performance optical switch technologies, today announced that its TrinityTM broadcast optical switch boasts less than 50% power consumption of rival technologies on a per port basis. Trinity will be demonstrated for the first time at IBC 2008, taking place at the RAI Centre in Amsterdam, September 12 to 16. The Polatis announcement comes as top operators are demanding more energy efficient equipment from suppliers, in the face of rising maintenance and operating costs. The Polatis Trinity optical switch is designed to offer broadcasters high performance switching of any signal protocol, with substantially lower power usage. "Broadcasters are confronting two contradictory requirements: ever growing numbers of high power consuming devices in equipment rooms, and corporate "Green Citizen" goals to reduce carbon footprints, energy consumption and non-biodegradable waste," said Sean Gordon, Director Video Products at Polatis. "New devices and new technologies are needed to achieve similar switching tasks with high performance at lower average power consumption, and Trinity is able to meet that requirement. "The switch offers improved performance when compared to traditional signal switching products, and uses less than half the power to run and to cool." Trinity consumes minimal power, leading to longer operating life, less mandatory equipment replacement and greater ecological friendliness. The power consumption of a conventional Optical-Electrical-Optical switch, employing active transmitters and receivers integrated with an electrical switch core, is twice that of Trinity's. An associated inherent ecological benefit of the voltage driven actuators in Polatis technology is the lower current draw of the power supplies. A Trinity 16x16 switch's power consumption is rated at only 20W. Polatis employs its patented DirectLight® beam steering technology to create a completely signal transparent non-blocking switch fabric up to 32x32 ports. DirectLight's voltage driven technology translates into inherently lower power consumption versus other optical switch technologies.